I am a clotheshorse from way back. I fondly remember the smoked yellow silk dress I wore, age seven, to my cousin’s bar mitzvah. I recall a hand-me-down lace dress that did not suit my style when I was eight, and even in elementary school I insisted that my skirts skim my knees, a length I have mostly adhered to ever since, unless it was openly unfashionable. During one period of my life I consistently designed clothes in my dreams. I might have enjoyed being a couturiere, were it not that I was atrocious at sewing. For many years I had a wonderful seamstress who made my clothes. Since she disappeared I haunt fashionable boutiques, buy clothes and overstretch my budget. Today’s approach to clothes puzzles me. Ads for garments, shoes and handbags fill glossy magazines and newspapers. Their outrageous prices could feed entire families for years. Are designer clothes another manifestation of our two-tier society? Some of these extravagant gowns are gorgeous and suitable for fairy tale princesses, but there is also an entirely different category: overpriced items embellished with tears, holes and other signs of hard wear. If I had owned them during my teens, my mother would have forbidden me wearing them. The latest upscale fashions comingle with working-class togs. Occasionally my husband and I go to the opera, the theater or a fancy restaurant, venues that in the past would have entailed dressing up. Today the majority of our co-celebrants wear sweatshirts, jeans and the like. Clothes have a language of their own and presently the message is confusion. All this does not prevent me from loving to get dressed up. Since, as a solitary writer, I have few occasions, I fuss for the bimonthly brown bag lunch gatherings of my Brooklyn writers’ group. Last time I went to the meeting I wore a cute hat, a fetching scarf and a chic French raincoat. I had bought the latter years ago at the annual Crafts Fair held at Lincoln Center, and it usually elicits some comments. I knew that I was dressing up solely for myself. Discovering that people stop caring about what you look like is a milestone most women have to contend with sooner or later. Shortly before I reached my host’s brownstone I spied my colleague Peter, a fellow member of the American Society of Journalists and Authors (ASJA), ascending the stoop. Peter was wearing the most beat-up, rain-soaked hat in existence and an equally beat-up, rubbed-down leather jacket. Just then a nice-looking man passed both of us. He took no notice of me but called out to Peter: “Nice hat man—and I like the jacket too.” So much for me getting gussied up! This entry was posted in Uncategorized and tagged asja, brooklyn, brooklyn writers, clothes, clotheshorse, clothing, crafts at lincoln, crafts fair, fashion, trends, writing. Bookmark the permalink. 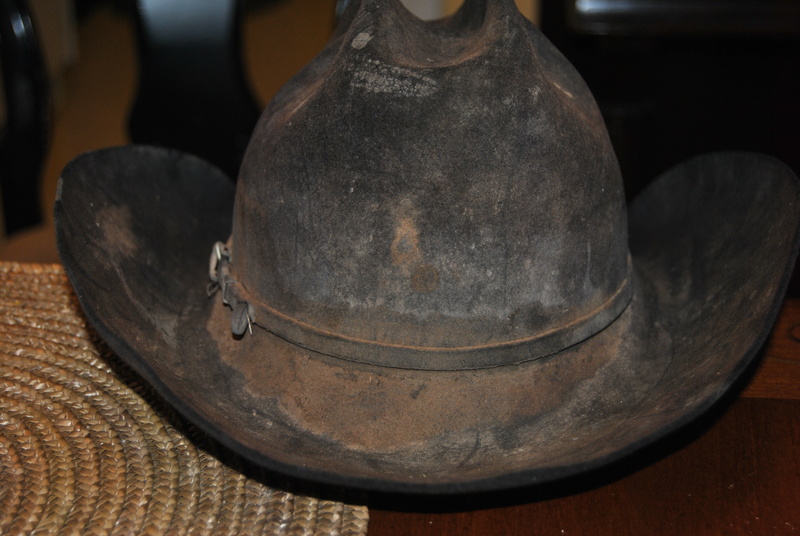 The hat is still a 12 year-old Stetson,,, the jacket is a World War Two vintage A-2 summer weight pilots leather jacket. Merci Suzanne!